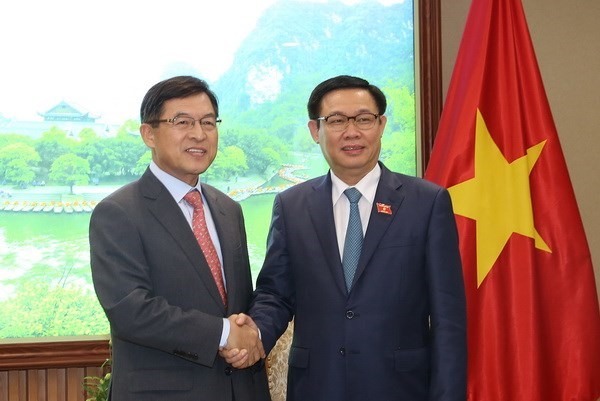 HÀ NỘI — Deputy Prime Minister Vương Đình Huệ on Thursday praised Samsung Vietnam for increasing its localisation rate. Receiving General Director Shim Won-hwan in Hà Nội, he also expressed pleasure in the growth of the company in the country. Shim informed the PM that the firm’s exports had reached US$44 billion and is expected to rise to $52–53 billion by the end of 2017. About 160,000 people are directly employed by Samsung factories in Việt Nam, and they indirectly employ about 20,000 others, excluding employees of the company’s suppliers, he said. The number of Vietnamese businesses directly supplying components to Samsung has risen from four in 2014 to 29 in 2017, and this is expected at 50 by 2020. Samsung has devised a detailed training programme to turn Vietnamese firms into its suppliers, Shim said. The company has organised workshops and supporting industry exhibitions to seek vendors, sent Korean experts to give advice and help improve the capacity of local firms with potential, he added. The firm has also paid attention to personnel development through training courses and sending skilled employees to the RoK for further training, the executive said. Expressing his pleasure at Samsung’s development in Việt Nam, Deputy PM Huệ said that with its projects in Bắc Ninh and Thái Nguyên provinces as well as HCM City, Samsung has become the biggest FDI investor in Việt Nam with total registered investment capital of $17.3 billion. He said he highly valued Samsung Vietnam’s moves to develop the local support industry and raise the rate of locally-made components. He asked Samsung to set up a research and development centre in Việt Nam soon, adding that the Vietnamese Government will actively support this project. The Deputy PM also suggested Samsung, a multi-sectoral and multi-national group, to invest in other fields that it is strong in, including energy, seaport infrastructure, science and technology, and healthcare.